When I think about summer, I think of long, lean days, blue water, tan legs, iced tea. I can survive winter, but it’s really about paying my dues until my favorite season returns. Summer means flying west into a golden sun or heading home trying to beat the darkness so I can sleep in my own bed. The days are full of opportunity, but whatever type of airplane you fly, summer flying has a different set of challenges; pilots have to deal with heat and humidity, dehydration, wind, turbulence, warm fronts, thunderstorms and wildfires. In the Southeast, where I live, summer haze is a fact of life. You might hear ATIS call “Sky clear, visibility 5 miles,” but in the air it seems like visibility is 2 miles and you’re flying in a milk bowl. The hotter and more humid it is, the hazier it becomes. Obstacles pose a different reality to pilots in the eastern part of the U.S. In Alaska, where I learned to fly around really big mountains, I wondered why the Appalachians were considered so dangerous. I quickly understood it when I started flying in the Southeast because the ever-present summer haze conceals what’s in front of you. Surprise! There’s a big piece of granite up ahead! I’ve lost friends in these obdurate mountains and am very aware when flying around them. VFR pilots need to trust their instruments and fly higher than any obstacle that might be in their way—whether the obstacle be a mountain or a tower. Luckily, today, most of us have obstacle and terrain mapping on our GPSs. When I moved to Florida, friends asked if I was concerned about hurricanes, but I said extreme weather is possible anywhere. A microburst hit our airport in Tucson in early August one summer. The winds were so strong that they lifted the roof of my hangar, ripped the doors off (one was later found in the desert over a mile away) and pushed one into the hangar crushing my little Piper J-3 Cub. Another airplane in the hangar, a Super Decathlon that belonged to friends, looked okay from the outside, but when we looked in the cockpit, the G meter read 11 G’s! On further inspection, it was discovered the spar was broken. The wind must have picked it up and slammed it back down. Weirdly, too, posters on my walls were found in the tail of my sad and twisted J-3. Microbursts aren’t uncommon in the Southwest. Capable of producing straight-line winds of more than 100 mph, they can cause as much destruction as a tornado. 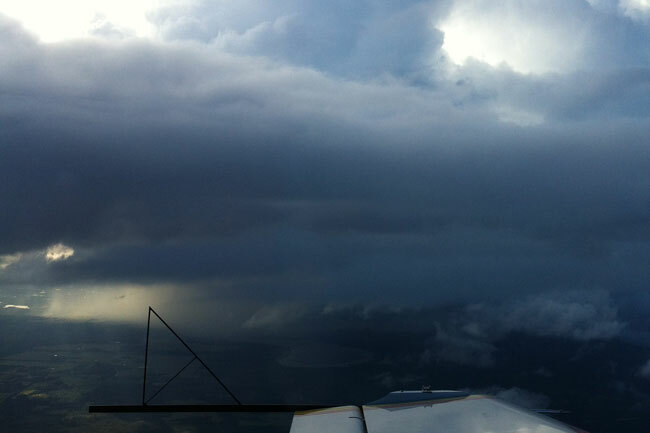 Needless to say, pilots need to steer clear of isolated storms of any kind. When the Southwest heats up, the weather can get wild in other ways, too. The heat and turbulence can be intense. It’s a dry heat! But the humidity is so low in the summer that we had a swamp cooler in our hangar to help keep the wood wings of our airplanes from shrinking. The heat is amazing. I’ve tried to practice aerobatics in the summer in Tucson, but it’s nearly impossible. You have to get up before daybreak to be in the air before the temperatures soar into the triple digits, and by 9 or 10 a.m., it’s just too hot to fly, both for the pilot and for the airplane. And then there are the ever-present desert dust devils. Causing a swirling updraft, dust devils are usually harmless, but can be big, tall and something you don’t want to fly into, if possible. Fierce and violent, thunderstorms can be found on any afternoon anywhere in the country. A few years ago, a friend of mine from Kansas City was flying his Pitts S-2A a little too close to a thunderstorm when lightning hit his airplane and welded his throttle and mixture controls in position. He was unable to move either control, but luckily he was at cruise power setting so was able to fly to the airport and use the mags to cut the power so he could land without incident. Lucky, also, that he had good stick-and-rudder skills and handled the situation without turning it into an emergency. Obviously, we need to give thunderstorms wide berth! Summertime and the living in easy, but not so for pilots at high-field-elevation airports like Truckee, California (5,901 feet MSL) or Telluride, Colorado (9,069 feet MSL), where flashing signs at the runway hold short line remind pilots that the density altitude is likely over 10,000 feet MSL. High DA isn’t to be taken lightly. The air is thin and performance can be severely compromised. I’ve flown airshows at some very high airports and always have to fly a very modified routine from the one I do at sea level. The airplane doesn’t have the same feel in the thinner air, and while indicated airspeed might be the same, true airspeed is much higher. Takeoff rolls are longer and landings are faster so you run out of runway much sooner than you would at sea level. Even the Aeroshell Team asked other performers about flying the Rifle, Colorado Airshow (5,500 feet MSL) before they performed there a couple of years ago. The Aeroshell Team is arguably the best civilian aerobatic team on the planet, and the pilots are very experienced crop dusters and stick-and-rudder pilots, but they had enough respect for density altitude to ask for advice and arrive early for several practice sessions, the epitome of professionalism. You can’t prepare for everything; dealing with the unexpected is called experience. One summer I was flying my B-55 Baron from an airshow and stopped for fuel at KMAF, Midland, Texas (2,800 MSL). It was a normal summer day, temps around 96, with strong, gusty winds. The Baron had a door seal that was inflated with a small hand pump to help lower wind noise in the cockpit. After I taxied to the hold short line, I did my preflight check, shut the door, inflated the hand pump and thought everything looked good. I started my takeoff roll and the door popped open, as I failed to shut it properly. It was too late to abort, so I continued the takeoff roll. An open door is no emergency, but the pilot has to land because it’s impossible to shut it in flight. This time, however, because the door seal was inflated, the door opened much more than it would have normally and created a lot of extra drag. The airplane staggered into the air and didn’t want to climb. I milked it around to downwind, carefully turned base keeping the airspeed above blue line and landed without incident. I never inflated the door seal before takeoff again. What about the other joys of summer flying—heat exhaustion, fatigue, dehydration? Flying small airplanes without air conditioning can be quite pleasant—in the air. On the ground, it can be a different story. Heat exhaustion isn’t as serious as heat stroke, but it’s serious. I’ve gotten heat exhaustion at airshows after sitting in an Extra cockpit with very little ventilation waiting to take off. The effects of heat exhaustion can be dangerous for a pilot, so I’m extremely careful about this and keep ice, water and cold towels nearby when temps are soaring. Speaking of hydration—did you know that I can loiter over a fire flying an OV-10 for five hours without a potty break? Here’s my secret. Before the flight I drink a little bit of water so I don’t get too dehydrated, then I eat some salty crackers. The key ingredient is the salt in the crackers that helps me retain water. After I land, I drink a lot of water to rehydrate. I haven’t found a magic formula to combat fatigue, however. In my opinion, fatigue is the most insidiously dangerous thing you can experience when operating machinery. With the engines droning and the autopilot on, it’s just too easy to nod off or to make other mistakes. If you’re too tired to function well, pull over to the nearest rest stop—land and wait it out. Any FBO will let you find a place to take a snooze. Fire season is worse during summer months, but fires can happen anytime when the temps are high and winds are strong. Do not fly too close to a wildfire! Do not circle the fire! Give any fire a respectfully wide berth. Aerial firefighting operates at all altitudes, from low level where tankers and helicopters make their retardant and water drops, to higher altitudes where air attack pilots and media helicopters circle, sometimes thousands of feet above the fire. The normal range for a Fire Traffic Area is 7 miles, but allow for ingress and egress for tankers and other airplanes. If you see smoke, stay at least 10 miles away to be safe. Part of what makes airshow flying so challenging is that an airshow pilot finds themselves faced with new situations. For example, I won’t pull my airplane out to practice when the wind is gusting to 30 knots, but I’ll fly an airshow in the same strong winds. As aviators, we can’t train for every situation that confronts us, but we can use good judgment and feel confident that we can handle new and unexpected situations. I get confidence in practice and training, but equally important is knowing I always have a way out—whether it’s a 180-degree turn or landing at the closest airport. Heat, turbulence, high altitudes—I figure that if others have flown in those conditions, so can I. Each new experience needs research, consideration, respect and a willingness to learn from others. I love getting firsthand experience. Last summer, a flying farmer gave me a perfect piece of advice—if you have an engine failure and need to dead-stick your airplane into a field, go for the corn and never the soybeans. The beans have vines that can get you tangled up, but the corn will cushion your landing. Every season has its challenges, but summer flying is what I live for. It’s beautiful to cruise above a broken layer of clouds and feels a little like paradise, smoothly cruising closer to heaven. But as the day gets warmer, the clouds get higher and when I start to run out of altitude, I have to descend into the bumpy and hazy air below.